Having announced its 4G plans today, Vodafone has gone on to fill in a few more of the details of its ultrafast vision. 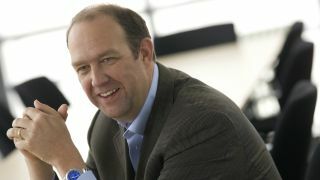 Speaking in a conference call with TechRadar, Vodafone UK CEO Guy Laurence emphasised that Vodafone's weapon for success over the likes of O2 is its entertainment partnerships. "4G finally has a reason and that is entertainment," he said. "We need to get people used to using entertainment on their phones." But despite the fact that Vodafone is offering unlimited data for the first three months, Laurence told us that unlimited plans aren't on Vodafone's horizon. "There's not a need for unlimited in my view," he said, drawing on the example of US networks that have struggled with unlimited 4G. "We won't be going unlimited in the near future. In fact I'm not sure it will go unlimited at all"
Vodafone is convinced that its current offering should suffice, and if people need more then they can throw additional packages on top. "If you look at some of the tariffs out there, they have very low amounts of data," said Laurence. Laurence declined to say whether the deals with Spotify and Sky were exclusive. He was also hesitant to give any sort of figure in terms of expectations of consumer interest, saying that he didn't want to start "an arms race in terms of customers". Vodafone's 4G network will launch on the same day at O2's, and in the footsteps of EE. Customer will be able to order 4G packages from August 12, while those on current 3G Red price plans will be able to get immediate access to the Spotify and Sky Sports services for an extra £5 a month from that date. They'll then be able to upgrade to 4G come the rollout.